A slice of delicious ice cream pie is a perfect dessert to cool off on a hot summer day. On August 18, indulge yourself with some ice cream pie as it is National Ice Cream Pie Day. Ice cream pies are made by placing softened ice cream inside a baked pie shell or graham crust. Just as regular ice cream, ice cream pies come in varying flavors. Basically, you can make any flavor of ice cream into a pie. There even are ice cream versions of popular regular pies such as pumpkin pie or lemon meringue pie. To celebrate National Ice Cream Pie Day, go out to your favorite ice cream parlor or restaurant and indulge yourself with this delightful treat. 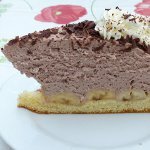 You can also make an ice cream pie at home and share the dessert with your friends and relatives. We suggest that you try out the following easy recipe. Crush 15 Oreo cookies. Add 1/2 cup melted butter and mix until combined. Press mixture into a pie dish to form a crust. The crust must go 3/4 of the way up the sides of the dish. Mix 1 quart softened vanilla ice cream, 1 cup chunky peanut butter, and 1 tsp vanilla until smooth and well blended. Pour filling into crust and put in the freezer until frozen. Before serving, drizzle 1/4 cup chocolate syrup and sprinkle 1/2 cup crushed peanuts on top.